Joe Jonas, don't say we didn't warn you. 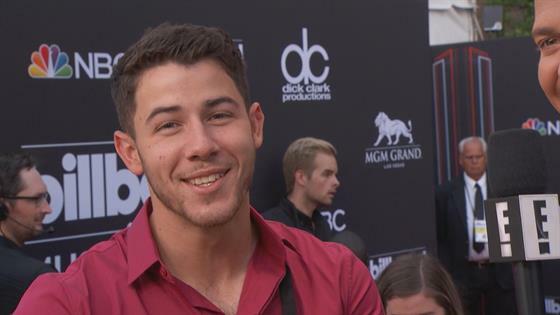 While appearing at the 2018 Billboard Music Awards Sunday night, Nick Jonas was more than ready to present one of the biggest awards of the night. At the same time, he was more than willing to share some details about his brother's upcoming bachelor party. "It's our bachelor party. As much as it's for him, it's really for all of us," Nick joked on Live From the Red Carpet with E! News' Jason Kennedy. "We've got no plans yet. It is going to be respectful, very respectful." He later added, "We're going to have fun. We have to. He is going to get married. It's a big deal." For now, Nick is focused on his acting and music career. In fact, he may have a few surprises up his sleeves when he's visiting Las Vegas. "I might be hopping up at EDC for a surprise. I may have ruined the surprise," the "Jealous" singer shared. "We will see what happens. I'm in the studio now working on music. Staying busy." Nick continued, "I'm having a good run, just enjoying the ride right now. The great part about tonight's Billboard Music Awards is that it's a celebration of music. I've kind of been bouncing around acting and music and to be able to be with my fellow musicians celebrating is a good thing."